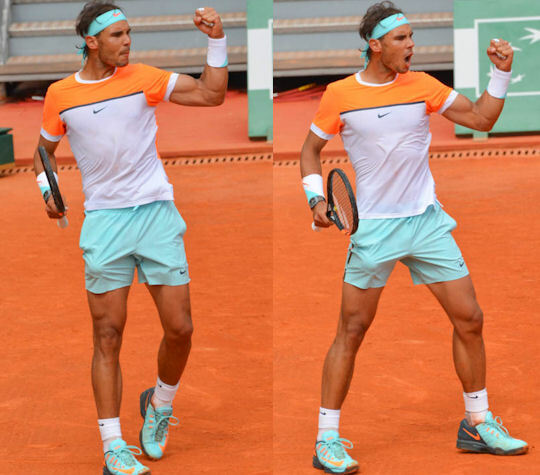 Rafa didn’t win the tournament this year; nonetheless, it was a very successful and hopeful week – made even sweeter by the wonderful reports, photos and videos posted by the intrepid, resourceful and dedicated Vamos Brigade members who attended the Monte Carlo Rolex Masters. I wasn't able to watch Rafa's early matches live, so I rely on the observations of the members who were there. The match was closer than the score reflects. MAC agreed, "Pouille hit far too many winners for my liking." 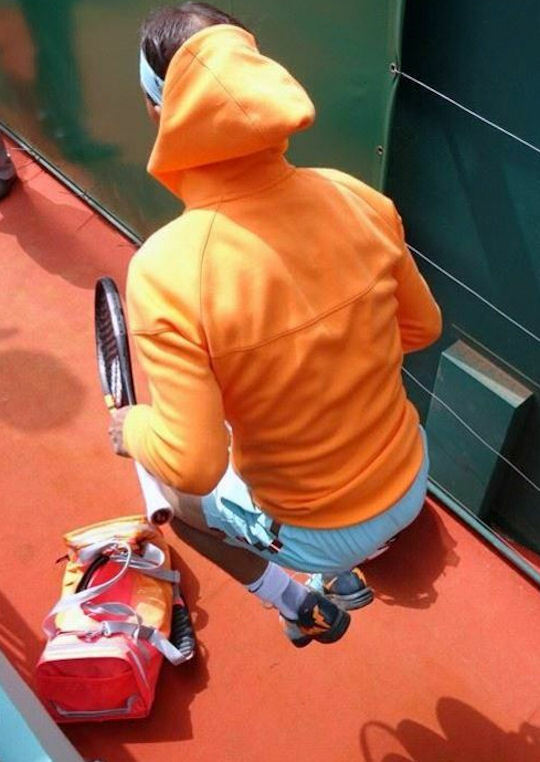 And confessed, "I prefer it when all Rafa's opponents' shots go way long or in the net." 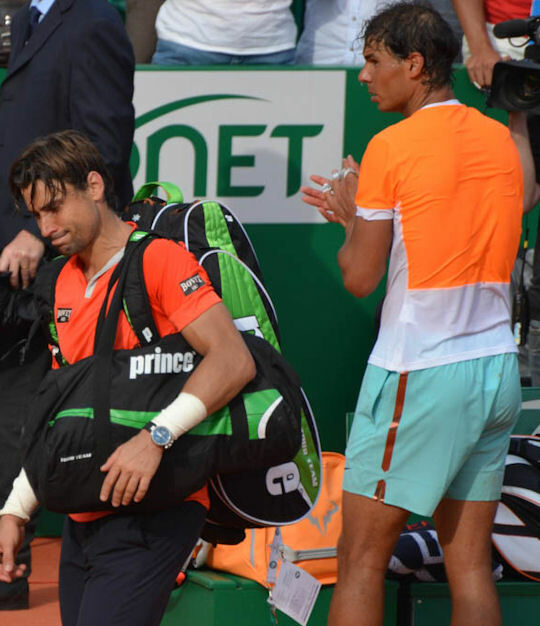 JLB summed it up, "Seemed like a very good start to the tournament, a match to settle more nerves than just Rafa's." "[We] were feeling relatively calm about the match. 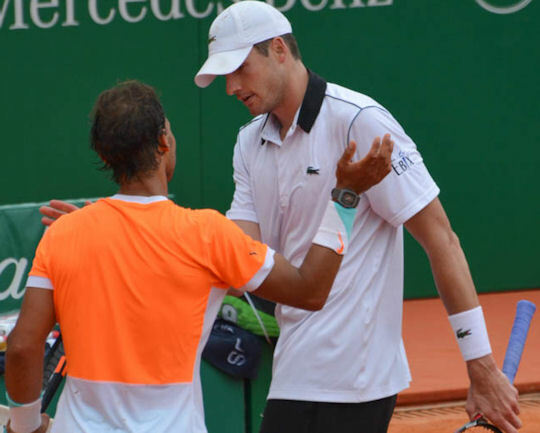 Expected it to be tight - Isner can play well when he wants to - but expected Rafa to come through in the end. "Have to say, he maximizes his talents. He it some volleys today that I'm sure not even he knew how he did it. The endless aces are incredibly dull, but the guy can play. Some of his flat backhands were scary. The good thing is Rafa was doing much better at soaking it all up than he would have done a month ago. He seemed able to manoeuvre himself out of the more challenging positions on court, and he was able to be patient and to wait for the right opportunities to turn the points in his favour. "Fabulous to see him grab that 1st set when perhaps Isner ought to have won it - much more the Nadal Way that we've not been seeing of late, so that was encouraging. The following vamos was pretty epic too." "Thought Rafa was unlucky in the 2nd set - he was playing much better than Isner, holding serve easily, then didn't break after 0-40. It may, however, be our fault that he lost serve, as we mentioned that fact. Will keep our mouths shut in future! Just absolutely can't understand the time violation warning at BP down here - that was not the longest Rafa had been in-between points - he'd started off pretty slow - so why choose that moment? It was a choice that Dumusois made to impose himself on the match at that point, and it's offensive. "Really happy to see Rafa focus well in the 3rd - not a hint of nerves, and he played well. 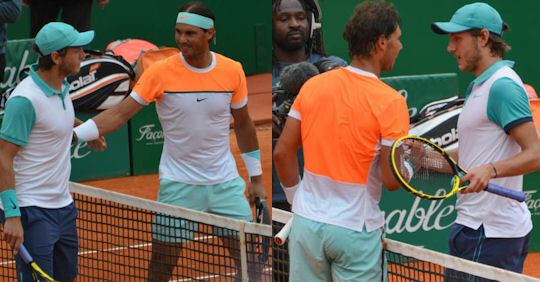 … Shame that the match ended on an error because it denied Rafa a big celebration, but that's ok. He was a happy chap, no? and we were ecstatic. Wonderful to see him pull out one of these matches at last, and hopefully it is the start of good things for him." "After last year we were more than a little nervous about this match. It all seemed to go pretty well for the first set and a half. "After he got his second time violation things went a bit pear-shaped for a while. Daveed's perfectly timed injury time-out didn't help. Nor did the … crowd's prolonged Mexican wave just as he was trying to serve out the match. "We were really worried about the effect losing a match having been a set and double break up would have on Rafa's fragile confidence. "How amazing it was for the Rafa of old to show up, regroup and storm through the third set. That has to have helped him believe in himself. "He was certainly looking pretty happy at the end, though. … He was grinning from ear to ear while signing for fans underneath the stands. You will have to take my word for it, though, since I singularly failed to capture any of it on film." "Rafa played a good match with some ups and downs, but he fought out a brilliant match, a good sign for him. He was in complete control for the best part of the 1st 2 sets, but ended up at a set all, not unlikely given the opponent. He was hitting the ball crisply - the sound of the ball coming off the racquet was fabulous, really cleanly struck (until it wasn't) - and Rafa seemed to lose his rhythm a little with the time violations, David's injury timeout and the Mexican wave. I know, he's experienced enough not to let that happen, but you can't have everything. He competed well, and started to hit through the ball better towards the end of the 2nd set, which left him well prepared to start the 3rd, and he won that one well, withstanding a lot of pressure. "He used the serve to the body exceptionally well, his forehand down the line and crosscourt backhand were both working well for vast swathes of the match, he cleverly brought in the slice a few times which Ferrer dumped into the net the majority of the time, and he came to the net when he could. It wasn't a perfect match, I know that, but it had positive things in it too, and he won it, which is the main thing (though yes, it ought to have been an easy straight setter, but perhaps Ferrer ought to get some of the credit for turning things his way for a while). 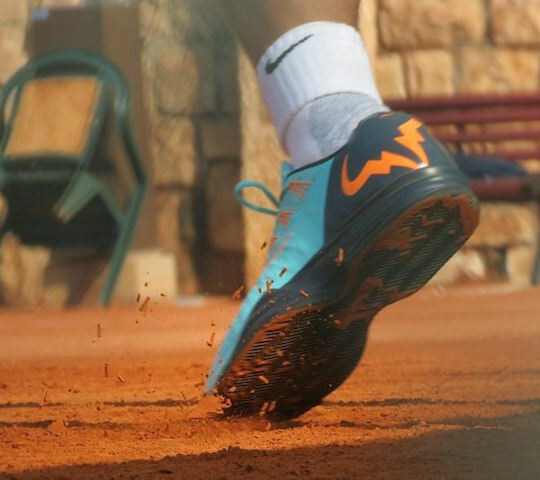 [Rafa] gets to play another match, and you know he'll give it his everything." Rafa's previous two matches, which were hard-fought three-setters, took their toll, though he fought to the last point. Rafa's progess at this tournament was enough to make any fan proud and happy, but, because of the dedicated blogging of the many Vamos Brigade members attending this year, we were treated to stories, photos and videos of Rafa's practice sessions. The variety and details from their experiences made us feel as if we were right there with them. There are too many wonderful photos, videos and anecdotes to fit on the home page, so I'll just add a few more and say, "Thank you so much!" to mars06, JLB and MAC, alegria and jen and the other VBers who joined them in cheering Rafa on. JLB finally captured Rafa's leap before he dashes to the baseline to warm-up. MAC photographed Rafa wearing a sleeveless top during one of his practice sessions. Along with drills, jen recorded one of Rafa's shirt changes from his Monday practice session. mars06 caught Rafa in mid-jump before his entrance for the quarterfinal match.